Grammarly is one of the must have blogging and writing tools, and every blogging and writer must use it to proofread their articles. It's proofreading feature saves you a lot of time. Are you looking for grammar and spelling checker tool? 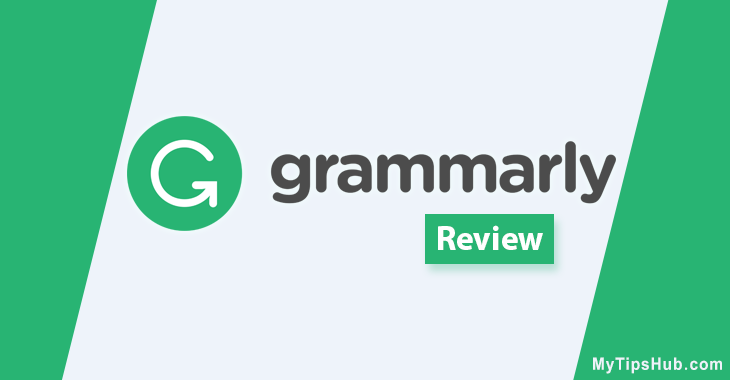 Well, in this post I will be sharing Grammarly review which is so far the best tool for writing error-free blog posts. What it does is, it check your posts for grammar, spelling, punctuation, and many other errors, highlight them and suggest possible corrections as well. While producing/editing contents it proofreads your content to address any possible mistake which should be fixed. Reading the same article multiple times isn’t an easy job but using Grammarly you can decrease workload. Here, I am going to share all the features to help you decide whether it’s the tool you are looking for or not. After using it for more than a year, I thought why not write a review on Grammarly to share my personal experience with MyTipsHub readers. Grammarly, Inc. was founded in 2009 by Alex Shevchenko and Max Lytvyn. Its headquarters are located in San Francisco and Ukraine. At the time of writing, they have more than 8 million registered subscribers worldwide and 8 billion web pages indexed to check plagiarism. Moreover, it is licensed by more than 600 universities and corporations. It is an online proofreading tool that helps to write error-free contents. It is a very helpful tool for native and non-native English speakers to improve their English language skills. It has some extra awesome functionalities than other traditional spelling and grammar checker tools such as plagiarism checking and citation suggestions for contents copied from other sites or sources. You can check your articles with more than 400 grammatical rules to make them errors free as well as can check Plagiarism to making sure it’s unique and not published anywhere else before. The most common problem faced by most of the new writers is spelling mistakes. And the primary function of Grammarly is spelling checking. It is a very useful spelling checker tool that can help you if your writing skills are poor. Grammarly is the world’s best online grammar service in terms of fast and smart spelling check. It scans the whole page and underlines the wrong words by suggesting the possible corrections. You can fix the incorrect word just by clicking the underlining word, and a pop-up will appear with possible correct words. Grammatical mistakes are also the most common mistakes that every writer or non-native English speakers often face. Therefore, Grammarly has designed an advanced grammar algorithm that checks the content with over 400 grammatical issues. It improves your English by suggesting the correct use of subject-verb, forms of the verb and much more that any other grammar checker tool. Along with indicating errors, the most beautiful thing about this tool is, it provides the possible reason for every mistake that we made. Isn’t better to learn and enhance your writing skills instead of just correcting it? In short, users can improve their English skills as well as contents correction at the same time. These mistakes can change the entire meaning of any sentence if you use it in the wrong way. Punctuation marks are the symbols that are used to organize or structure the phrase. In other words, they used to clarify the situation of the sentence. It helps readers to understand the exact meaning of the phrase or sentence. Punctuation marks contain symbols like a comma, colon, periods, exclamation sign and question marks, etc. Unfortunately, it’s hard for new writers and bloggers to know the proper use of punctuation (especially when they are non-native English speaker). But you can solve this issue with the help of Grammarly because it also supports to check missing comma, period, colon and semicolons and will show you the correct symbol. It does not only assist in writing a spelling and grammar error-free contents but also suggests the suitable style of phrases. If you are bad in writing a proper sentence, then it will advise you a possibly correct sentence. 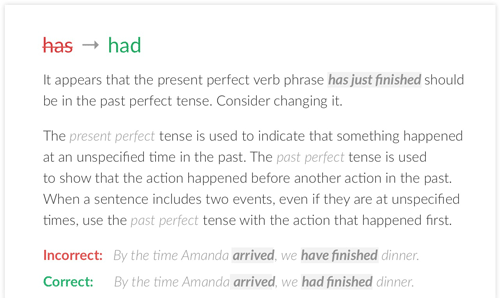 The most exciting feature of Grammarly is Plagiarism checking. It helps to detect contents that already published on the internet or any other blog. You may know, original and unique content is the key to building your brand name and loyal readers. Imagine, you read an article on two or more different sites; chances are you’ll either leave the one or both sites due to providing old or copied content. No one has enough time to read a single piece of content again and again. More than 4 million users are using its Plagiarism checker to make their articles unique to compete with competitors. It checks your content with over 8 billion web pages. There are hundreds if not thousands of copycat found on the internet who copy paste data from other sites and publish on their blog. In previous years, Google has launched Panda update to search for and de-index those websites who copy contents from other sites. So, you should need to check your posts for Plagiarism before publishing it on the site. Let’s see, how it works. To verify the legality of Plagiarism checker, I copied a paragraph from a website and pasted it in the Grammarly online editor. For more testimonials, then I copy a phrase from one of my blog post “Best Online Grammar Checker Tools for Better Writing.” and its Plagiarism feature alerted me that the phrase copied from MyTipsHub.com within the span of seconds along with URL address or citation. It’s way faster than any other online tool along with checking grammar mistakes. As I am not a native English speaker, I face many problems while writing articles because of poor English vocabulary. I always try to learn and enhance my vocabulary as I can. But when I started using Grammarly, it changed everything, the changes that help anyone to write better, well-optimized and easily readable articles. If you want to enhance your vocabulary, then it’s the best proofreading tool. It allows you to check the full details of words and their synonyms too. Even if you select a company name or product name, it will show you all of its details by grabbing info from Wikipedia. What you do, if you found a word while reading an article which you don’t know? Before Grammarly, whenever I found a word that I am not familiar with, I always go to Google search to find its meaning and related words. But now with this tool, I can instantly check the meaning of words on the website without leaving it. So, if you found any word then double click on it, and a popup will appear with all details about selected word. When I was studying theory about Array on the website, I found a word “cumbersome” that was unknown to me. I double clicked on it to get information. Instantly a popup appears with the details of that word as shown in the below snapshot. As I previously said that it also suggests synonyms. Many times we use a single word many times in document which affects the beauty and phrases style. So, it is best to replace repetitively used words with synonyms by taking the benefits of vocabulary feature. To check synonyms, double-click on the words to find similar words. In my case, I clicked on “serious” to see its synonyms. See in the below snapshot to check result. So, it proves that Grammarly is also best for enhancing vocabulary. With the help of it, you don’t need to go anywhere or to open your dictionary book to find meaning and related words. You can do it instantly and saves a lot of time. Selecting a document type is also a very useful feature in some cases. Writing articles for a website is way different than writing essays and storybooks. 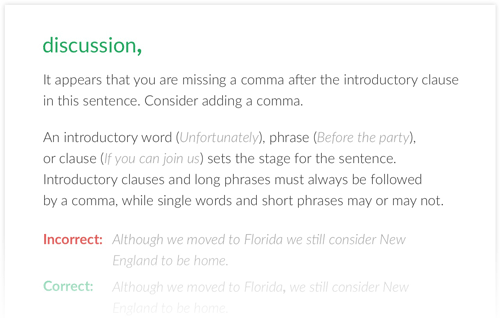 Writers can easily choose the document type in Grammarly online editor. So, it will suggest spellings and styles of phrases according to that particular type. The selection of the right document type is necessary to get suggestions accordingly. Online editor is one of the easy to use ways for addressing spelling, punctuation, vocabulary, plagiarism and other four hundred english rules. You can also upload and download the document as well as can create a new one in it. Moreover, You can access your contents from anywhere in the world by saving it in the online editor. 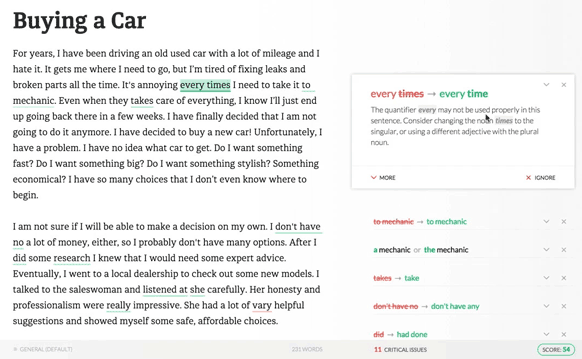 Grammarly makes writing way easier by providing the different web browsers extension. By enabling browser extension, you don’t need to copy-paste text in the online editor because it checks text we write anything within the web browser. No matter you’re a blogger or writer, you can correct grammatical and spelling mistakes anywhere on the website. It works well with all popular web browser such as firefox, chrome, and safari. I highly prefer installing the extension to take maximum out of it. Moreover, the best thing about installing browser extension is that you can check meaning, synonyms, and use of any word on any website, just by double-clicking on it. If you click on any company or tool, it will also tell you about it by pulling information from Wikipedia as I mentioned earlier. If you prefer to write in MS office, then you can use MS office extension. It gives you full access to all features that we get in the online editor. Just install and enable MS extension on your computer and write error-free articles. Unfortunately, MS extension not available for Mac users. But if you are using Windows on Mac then you can use its add-on. Another issue about MS extension is that it disables some features like auto save. They are improving service day-by-day and delivering incredible features to end-users. 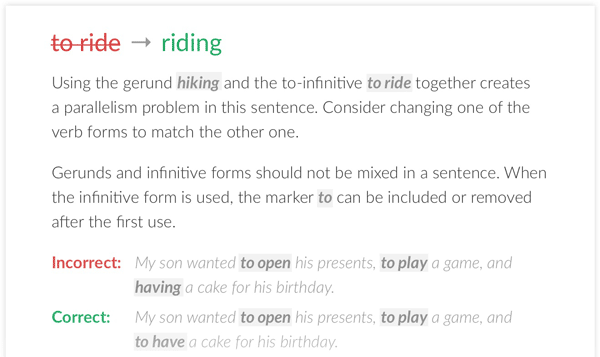 Recently they have designed native application now you can install Grammarly on your PC or Mac. You can drag and drop any document file inside Windows/Mac native app and can start editing your document file. Paying per month $29.95 is a little bit costly and most of the time I would not recommend buying any service for monthly basis. Why? Because it always cost higher than the quarterly or yearly. 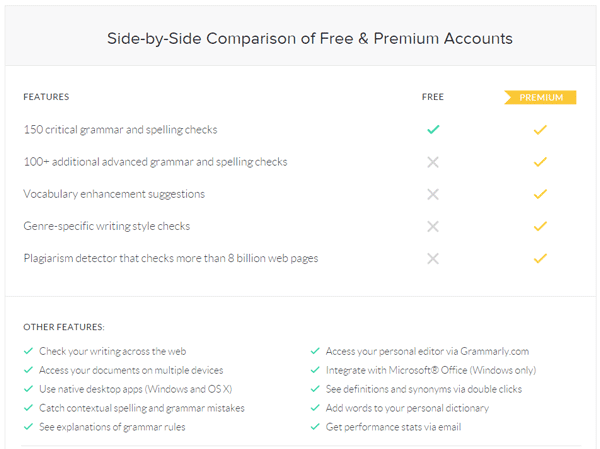 If you want to use Grammarly then you should go for the quarterly or annual plan, it will save you a lot of money. Choose a monthly plan if you don’t have enough money to buy an annual plan. The monthly plan is also best for trying their quality of service to check whether they are providing what they claim. At the price of $59.95 you can get it for 3 months, it saves you almost $10 per month because they offer a discount for the quarterly subscription. It’s way better than monthly plan and beneficial for bloggers/writers who want to produce outstanding content. Annual memberships costly $139.95 but in most of the cases it’s the best choice than above two because it saves you a lot of money. If you found their services good enough to buy then buy an annual plan and save some bucks. If we compare annual and monthly plan, it saves you $219. You can utilize these $$$ for buying other blogging stuff. Premium subscription has much more additional features than free. It allows you to correct advance errors in your articles. In the premium version, you can use the plagiarism and vocabulary enhancement feature. It also provides complete information about the errors and correct uses of words. You get a 7-Day money back guarantee to secure your investment. If you are not satisfied with the quality of service, then you can get the full refund. Money back guarantee is only for new users and only works within seven days after the purchase. If you cancel your subscription after renewal, then you will not be able to get your money. Who Should You Use Grammarly? No doubt, it is an excellent proofreader tool for students, bloggers, writers, freelancers, and business peoples. As a human, there is no guarantee that you can write 100% perfect article (in most cases) without making any mistake, so it’s important to use proofreader to correct all errors that our eyes miss. However, they developed a special service for students to enhance writing skills. It provides fully automated tutorials to revise their papers and to provide them with automated feedback. I had used Grammarly as a free subscriber, and I also suggest you do the same. If you find it helpful for you, then upgrade it to the premium subscription. After using it as a free user, I bought one year annual subscription and can’t resist myself to recommend it for bloggers and writers. Wrong spelling, punctuations and other mistakes in your blog posts can hurt your readership and visitors. Who wants to take this risk? No one. If you think your English or writing skills are not good enough to write error-free articles then just buy Grammarly without wasting time. Grammarly is an essential tool for those who are not the native-English speaker or having poor writing skills. Though the algorithm cannot replace the human proofreader, algorithms always work for what they designed for. You cannot entirely rely on human-designed software to make your articles mistakes free; you should have some know-how about grammatical rules, the use of rules and some basic knowledge. 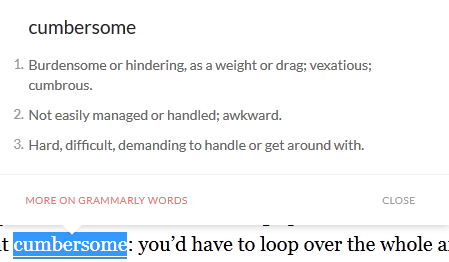 Finally, I highly recommend using Grammarly as a proofreader because human eyes often ignore the mistakes. But this software can easily detect those errors and will address with possible correct suggestions. Also with this tool, you don’t have to read articles again and again as I described at the start. I hope this review of Grammarly will help you decide whether you need it or not. Are you using it? Is it really worth using? I would like to read you thought about it in the comments section below, and please do share this post on Facebook, Google+ and Twitter or any other social network.